Claude Perrault (see the calculating machine of Perrault) was born in Paris on 25 September 1613, in the wealthy bourgeois family of a Parisian advocate—Pierre Perrault (1570-1652), and his wife Pâquette Le Clerc (or Leclerc) (d. 1657). Perrault was a numerous, talented, versatile, and close-knit Parisian family. Its founder, Pierre Perrault originates from a wealthy merchant family from Touraine, and moved in 1592 only 22 years old to Paris, to work as an advocate for the French Parliament. After their marriage on 27 January 1607, Pierre Perrault and Pâquette Le Clerc had seven children, but two of them died young, so Claude had four remaining brothers. The eldest brother—Jean Perrault (1609-1669), was (just like his father) a lawyer and advocate at the Parliament, and later was in the service of Henri II de Bourbon, Prince de Condé. 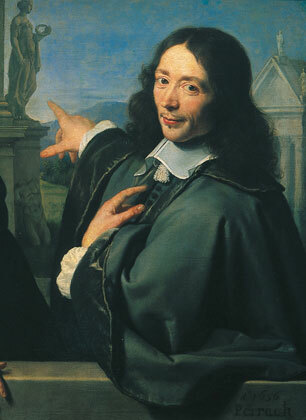 Pierre Perrault (1611-1680), who was also a lawyer and Receiver General of Finances in Paris (1654-1664), later became a famous scientist (he developed the concept of the hydrological cycle, and together with Edme Mariotte, he was primarily responsible for making hydrology an experimental science). Nicolas Perrault (1624-1662), was an amateur mathematician and doctor of theology in Sorbonne, known for his denunciation of the Jesuits, and who was excluded from the Sorbonne for Jansenism and for defending Antoine Arnauld. However, the genuine celebrity of the Parisian branch of Perrault family was found to be the youngest brother—Charles Perrault (1628-1703), who became the world renowned author of Tales of Mother Goose. The only daughter of the family—Marie, died at thirteen, and François, a twin of Charles, died in July, 1628, only 6 months. As boys, the Perrault brothers collaborated in such things as writing mock-heroic verse, and in adult life each brother aided the career of the other. Claude Perrault was educated at the prestigious Collège de Beauvais (later he was followed by his younger brother Charles), one of the leading schools of France, educating pupils whose parents were prominent in the French establishment. Claude's father wanted his son to study medicine, anatomy and mathematics, so in 1634 he enrolled the University of Paris to study medicine. Claude received his bachelor's degree in 1639, and two years later, on 19 December 1641, he received his master degree (doctor of medicine). After graduation Perrault started his career as a physician and later on became a leader of a group of anatomists, who undertook dissections and descriptions of various animals. He proposed two theories, concerning the circulation of sap in plants and embryonic growth from preformed germs. These theories were highly influential in his lifetime and for many years thereafter. In 1681 Perrault began publishing of an all-embracing natural philosophy, which comprehended his researches in anatomy, various aspects of animal and plant physiology, and acoustics. In his longest essay he explained sound as an agitation of air, rather than by the concept of sound waves. After twenty years of practicing medicine, around 1660 Claude Perrault turned his attention to architecture and now he is best known as the one of the architects of the eastern facade of the Louvre (see the photo bellow), known as the Colonnade, built between 1665 and 1680 and cited everywhere as a example of the classicist phase of the French baroque style. Perrault’s architectural career was actually inspired by the translation into French language he had started of the ten books of Vitruvius (published in 1673, with the help of Jean Baptiste Colbert), the only surviving Roman work on architecture. 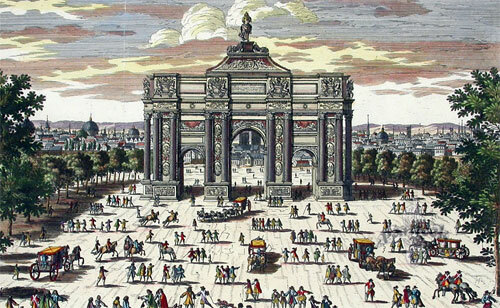 When King Louis XIV decided to rebuild the Louvre in the 1660’s, Perrault collaborated with the famous architects Louis Le Vau, Charles Le Brun and Francois d’Orbay to submit a worthy design for competition, and his design was selected (not without the support of his brother Charles, who was at that time the First Commissioner of Royal Buildings, and who promoted to this position of his brother Pierre, who was the Receiver General of Finances for Paris from 1654 until 1664). The Colonnade was begun in 1668 and was almost completed in 1680, by which time Louis XIV had abandoned the Louvre and focused his attention on the Palace of Versailles. 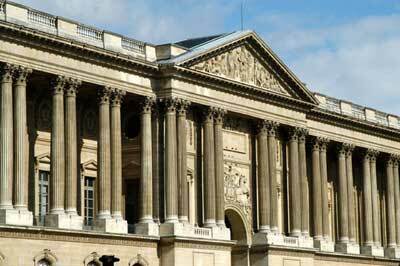 Nevertheless, the Colonnade may justly be regarded as the masterpiece of French architecture, and the finest edifice that exists in Paris. Perrault’s architecture projects include also several other building in Paris like: l’Observatoire de Paris; the church of St-Benoît-le-Bétourné; the church of St-Geneviève; the altar in the Church of the Little Fathers; the triumphal arch on Rue St-Antoine, started in 1670 (Perrault's design was preferred to competing designs of Le Brun and Le Vau, but was only partly executed in stone, and when the arch was taken down in the 19th century, it was found that the ingenious master had devised a means of so interlocking the stones, without mortar, that it had become an inseparable mass); a house for Louis XIV's prime minister— Jean Baptiste Colbert, in Sceaux in 1673. 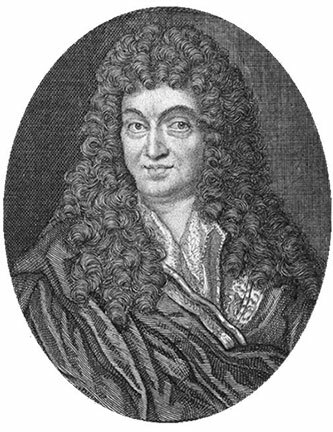 Claude Perrault became a founding member of the French Academy of Sciences (Académie des Sciences), when it was founded in 1666. Although Claude Perrault stopped practicing medicine c. 1661, he continued to treat family, friends, and the poor. Besides the calculating device, which is of a particular interesting for us, Perrault designed several other mechanical devices (a pendulum-controlled water clock, a pulley system to rotate the mirror of a reflecting telescope, etc.) and machines to overcome the effects of friction. Many of his machines were used in the Louvre and by 1691 at Les Invalides. Perrault also wrote an essay on ancient music, to show its inferiority to that of his own day. After Colbert's death in 1683, the position of Perrault family gradually declined. In middle 1680s Claude Perrault’s house was among those torn down to make room for the Place des Victoires, and he seems to have spent his last years writing his essays (like Essais de Physique, and his own attempt to apply a modern approach to beauty, his architectural treatise, Ordonnance des cinq espèces de colonnes selon la méthode des Anciens), living at his brother Charles’ house. 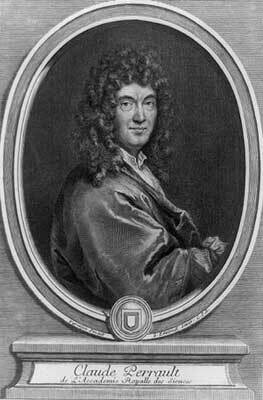 Claude Perrault remained a keen academician until his death, and died in Paris on 9 October, 1688, of an infection, caught during a dissection of a camel in the Botanical Garden of Paris.